This student housing community is the second project BBL has constructed for Paul Smith’s College. The new 94 bed, 34,000 square foot housing includes 23 four bedroom apartments, one staff apartment and a classroom area featuring a SMART Board interactive white board. 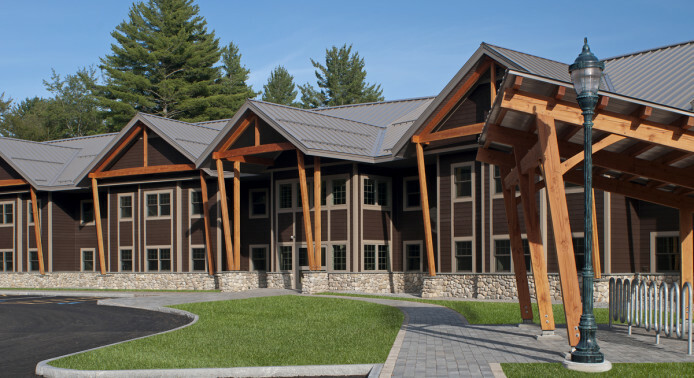 Situated on a hill overlooking the campus, the Adirondack themed building with timber frame accents, standing metal seam roof and cement siding complements the campus’ architecture. The project achieved LEED Silver certification and highlights items such as highly efficient heat pump systems with a geothermal well field, limited site disturbance, optimized energy performance and green materials, among other things. Approvals were necessary from the Adirondack Park Agency (APA) and the State Historic Preservation Organization (SHPO).